Columbus, Ohio is buzzing since the grand opening of Diamonds Direct. With over 20 years in the diamond business and 15 locations across the United States, Diamond Direct has established itself as a leading fine jewelry retailer. Diamonds Direct has developed a signature approach to serving their customers that has earned them exceptional reviews and awards like Most Innovative Retailer by JCK Magazine. We are excited for the future of our Coast Diamond Retailer of the Week, Diamonds Direct, Columbus, OH. While shopping for a Coast Diamond engagement ring, customers in Columbus can look forward to the Diamonds Direct experience of great selection and a no-risk shopping environment. Diamonds Direct is committed to offering you the very best selection in diamonds, engagement rings, and wedding bands. It is their goal to have the perfect diamond for your engagement ring at the right value. Every time. For every customer. Coast Diamond twisting halo engagement ring (LC5449) with intertwining diamonds to create a halo around the 1.5-carat center stone of your choice. Diamonds Direct and The Kimberley Process guarantees your diamond is conflict-free. This Coast Diamond intertwining band (WC10306H) of fishtail set diamonds is a sparkling addition to your stack of diamond bands. This Coast Diamond wedding band (WC5180H) is created with 0.30CT of fishtail set diamonds and is available in yellow, white or rose gold or platinum. Diamonds Direct’s exceptional experience doesn’t stop with the beautiful environment you find yourself shopping in. Stop in today to meet the staff at Diamonds Direct, Columbus and experience their great selection and no risk shopping environment for yourself. Congratulations Diamonds Direct, Columbus, OH! We are thrilled to call you our Coast Diamond Retailer of the Week! 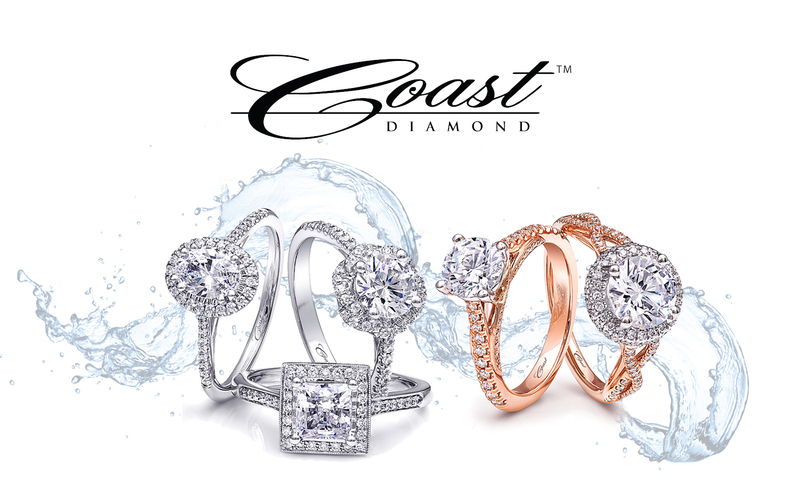 Find a Coast Diamond Authorized Dealer near you. Every once in a while we find a jeweler who seems to have customers that pick really special pieces from our Coast Diamond Collections. We know there has to be something unique about that jeweler. Ford, Gittings & Kane Jewelers is that kind of jeweler. Not only do they have a passion for quality, style, and value, but they also have an eye for the spectacular. This week we are thrilled to call Ford, Gittings & Kane Jewelers of Rome, GA our Coast Diamond Retailer of the Week. The gorgeous pieces chosen by Ford Gittings & Kane Jewelers’ customers is a direct result of their excellence in customer care. Such bold and beautiful choices aren’t made without complete confidence in your jewelers and the knowledge they provide. So what are FGK Brides choosing? Our Coast Diamond Signature Color Collection is full of one-of-a-kind rings, earrings and pendants made with precious gemstones hand-chosen by Coast Diamond’s founder and designer, Jay Gilbert. Make a statement with this radiant Coast Diamond green tourmaline ring (LCK10202-GT). Fishtail set diamonds (0.53CT) on the band and around the halo frame the gemstone beautifully. Of course, our most customizable engagement ring would be a choice of FGK brides. This Coast Diamond cushion shaped halo engagement ring (LC5410) is a petite design with a one-carat diamond center stone. There are countless ways to personalize this ring with the help of Ford, Gittings & Kane Jewelers. How would you choose to personalize the Coast petite halo engagement ring (LC5410)… oval, princess or rose-cut round diamond center stone? Wearing a stack of diamond bands is pure fun. Not just a glittering wedding band, this Coast Diamond fishtail set diamond band (WC5183H) has 0.18CT diamonds that make it a staple in any stack of diamond bands. An update on the stackable band trend for FGK brides… wear one in each color, yellow, rose, and white gold. We cannot wait to see what you choose with the help of Ford, Gittings & Kane Jewelers. Visit them today and don’t forget to #showyourcoast. Congratulations to our Coast Diamond Retailer of the Week, Ford, Gittings & Kane Jewelers of Rome, GA! While trends are exciting, when a bride is choosing an engagement ring, more brides choose a classic engagement ring design. Merriam-Webster’s Dictionary defines classic as serving as a standard of excellence, of recognized value, enduring, characterized by simple tailored lines in fashion year after year. There is a jeweler in Spokane that understands the importance of choosing a classic engagement ring. They are a classic themselves. They have endured in the Spokane Valley with a standard of excellence since 1950. We are pleased to call Tracy Jewelers of Spokane, WA our Coast Diamond Retailer of the Week. Fun fact about Tracy Jewelers… They use local couples, who happen to be their very own customers, as models in their ad campaigns. How Fun is that!?! Tracy Jewelers is the only AGS Accredited Gem Lab in Spokane. You can be assured the diamond center stone you choose at Tracy’s has been graded by one of the most reputable, consistent and demanding jewelers in the industry. Together, it is Coast Diamond and Tracy Jewelers desire that your classic engagement ring will bring joy to your life year after year, generation after generation. The petite Coast Diamond halo engagement ring (LC6067) is accented with 0.18CT sparkling round diamonds on the halo and band. A one carat round diamond center stone crowns this dainty beauty. The most popular choice of halo design is the cushion shape. This Coast Diamond cushion shaped halo engagement ring (LC5256) is an elegant choice with 0.35CT round diamonds on the halo and the band. This Coast Diamond round halo engagement ring (LC5403) becomes yours with the beautiful round diamond center stone of your choice. The double prong setting ensures your diamond is secure. Some of us search a long time for our dream ring. We have a picture in our head (or perhaps in our purse) of what the perfect ring looks like. Is yours an engagement ring with glittering diamonds on the band? Is it a beautiful cocktail ring with your favorite color gemstone at the center? Have you been searching for that perfect stack of diamond bands? Our Coast Diamond Rings of the Week are dream rings chosen by customers at our Coast Diamond Retailer of the Week, National Jewelry Company, of Ruston, LA. The gorgeous Coast Diamond rings that are chosen and personalized at National Jewelry Co. reflect their expertise and talent in creating a dream ring for you. Which one of these Coast Diamond Rings of the Week is your dream ring? The elegance of an oval halo engagement ring takes center stage this week. This Coast Diamond oval halo engagement ring (LC10233) features delicately set diamonds on the band. Make it truly unique and yours with a one-carat aquamarine center stone as seen in our featured image and on the National Jewelry Company Facebook page. A petite one carat Coast Diamond six-prong solitaire engagement ring (LC5386) has glittering diamonds set in petite prongs for lots of sparkles. At just under $1000, it is a perfect setting to show off a gorgeous round diamond center stone of your choice. Stackable diamond bands are versatile and fun to wear. This Coast Diamond stackable band (WC7034) has round diamonds set in marquise shapes with milgrain edging. A fresh way to create your dream stack… wear your favorite style diamond band in white, yellow and rose gold. All of our Coast Diamond rings are available in rose, yellow or white gold, or platinum. It’s time to try on your dream ring. Visit National Jewelry Company in Ruston, LA today! Congratulations to National Jewelry Company of Ruston, LA for being our Coast Diamond Retailer of the Week! Tell Her to go to Quest Fine Jewelry in Fairfax, VA for These Stunning Coast Diamond Rings! Have you heard about the fabulous refer a friend program at Quest Fine Jewelry? It’s just one of the many great incentives for you to buy your fine jewelry for yourself or as a gift at our Coast Diamond Authorized Dealer in Fairfax, VA. We told you about the countless fantastic five-star reviews to encourage you to visit this Retailer of the Week in 2017. In 2016, we featured Quest Jewelers and the countless ways they can help you personalize a Coast Diamond ring. Which one of these incentives will get you and your friends into Quest Fine Jewelry of Fairfax, VA, our Coast Diamond Retailer of the Week, for the ring of your dreams? When you refer a friend to Quest Fine Jewelry, you both receive $100 off your purchase of $1500 or more. This Coast Diamond oval halo engagement ring (LC10433) is the perfect reason to refer a friend. The 8×6 oval center stone is 1.25 carats of sparkle. Fishtail set diamonds (0.88ctw) stream down the band and decorate the halo. Personalizing a Coast Diamond ring makes a fun shopping trip to Quest for you and your friends. This Coast 0.50ctw diamond band (WC5181H) is a customer favorite with 14 round brilliant diamonds across the top of the band. Which do you choose… the warmth of rose gold, the glamour of yellow gold, or the sophistication of white gold? Check out this Coast Diamond band (WS20000) with one full carat of diamonds across the top. This Coast ring is the perfect gift for your 10th anniversary because it boasts 10 round brilliant diamonds delicately set in microprongs. Once again, we congratulate Quest Fine Jewelry, Fairfax, VA for being our Coast Diamond Retailer of the Week!